WarLight has just been updated to version 1.15.2! This is a small update to fix a few bugs from the previous update. This blog post describes what’s changed. – Optimized the My Games query a bit. – Added double-click support to the create-game pages that ask about choosing templates. – Changed the team controls from a drop-down to radio buttons. – Added rounded corners to the dashboard page. – Improved the display of forum threads when viewed on iPhones. – Fixed a bug that could cause an error when sorting the forwarding tournament invites page. – Fixed the report bug page for players using Opera. – Fixed a bug that could cause an error when a host changes players on a team game with open seats. – Fixed a bug that occurred if you tried to copy a game’s settings that used random teams. – Fixed the error message that came up if a non-member map creator attempted to add more than 24 players to a game on a map they made. – Fixed a bug that was causing several of the setting-highlights to default off for new players. – Fixed a bunch of other various small bugs in the new game creation screens. Prior to the last update, it was possible for non-members to change the boot times, practice game setting, and private messaging setting but still refrain from customizing one of the built-in templates. This allowed them to use the 16% luck values of the Strategic 1v1 and 2v2 templates but still set their own boot times. In the last update, these settings were moved into the primary customize step, which made it impossible to set them without customizing the template, and customizing the template meant that the luck value would be reset to 75%. This was an accident on my part – I didn’t realize that moving them would have this side-effect. Set up the following settings how you want them: the multi-day/real-time box, the boot times, the private messaging check-box, the personal message, and the pracitce game check-box. You must not change any other settings or this won’t work. Click Next. It’ll ask you to save the game as a template. Click the “No” button (even if it’s already checked), then press Ctrl+Shift+J. (Hold down the control and shift keys on your keyboard, and press J). This is a temporary work-around. In the future, there will be a better solution to this. WarLight now allows players to sign in with their Facebook account! This is simply done as a convenience since it means you don’t need to remember a separate password for WarLight. WarLight won’t post to your Facebook account or do anything Zynga-like. Facebook will never be required to play WarLight. This is just offered as an option for those who prefer it. You will always be able to sign in with an e-mail address as you have been able to up until now. If you want to start signing in with Facebook but you already have an e-mail based WarLight account, you can link your Facebook account to your existing WarLight account at this page. Even after linking your accounts, you can still sign in with your e-mail address and password if you choose too. This will just enable the option of signing in with Facebook. The main motivation behind allowing this is for the mobile client. Signing in with Facebook is only a small convenience on the website, but trying to type in an e-mail address and password on a phone is much more annoying. Therefore, it’s nice to give players another option. The Dashboard page, instead of showing all forum posts, will now only show forum posts that have been marked as notable by a moderator. If you want to see all forum posts, you can still click the Forum sub-tab and everything will behave as it did before. However, the Dashboard now provides a way for players that only casually read the forum to get the highlights without having to wade through the fluff. Moderators will choose forum posts that are interesting, funny, or they just think that the WarLight community will generally be interested in. I’m not going to pretend that this is a perfect solution to all of the problems that the forum faces, however it’s a step in the right direction. It’s likely that the forum will see further improvements in the future. WarLight now has an official form to report bugs. The Report Bug page will allow you to report any issues you’re having with WarLight. This is linked to from the contact page and the Help tab. Filling out this form is preferred over e-mailing me directly, even though this form really just results in an e-mail being sent to me. Often when someone e-mails me or posts on the Bugs forum they would leave out crucial information, which ends up taking a lot of my time to figure out. Often I’ll ask for additional information and I don’t get a reply, which leads to the bug not getting fixed. Sometimes so little information is provided that I can’t even figure out where they’re playing the game (WarLight.net, Google Hangouts, iPhone or Android). This form replaces the Bugs forum, so it’s been removed. 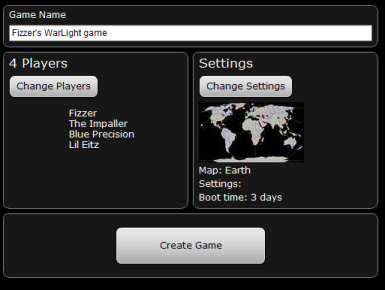 WarLight has just been upgraded to version 1.15.0! This is a big update and there’s a lot to cover, so in order to keep this blog post from getting too long, the new announcements will be split up between a few blog posts. If you’re impatient, you can read all the changes early in the change history tab. The page that allows you to choose who to invite to new games has received a major overhaul which brings a fresh look and new features. A: New tabs make switching between the different ways of inviting players easier. The Invite List tab is the list of players you’ve played with before (this is identical to the list of players you saw prior to this update). The E-mail tab allows inviting people by typing in their e-mail address. The Open Seats tab allows your game to appear on the Open Games tab. The AI tab allows inviting computer-controlled players to your game. The Search tab is discussed in point E below. B: The team controls are now right on the invite screen. This allows you to switch between FFA (no teams), manual teams, or random teams. Previously the team controls were buried in the game configuration options. It makes more sense to put them here so you can adjust the players and teams simultaneously. C: The invite list now splits itself between pages of 24. This fixes a big performance problem that used to occur for players with extremely large invite lists. If your invite list is large, you’ll notice a dramatic speed increase due to this. D: You can now search within your invite list. This allows you to easily find people by name or clan tag. E: In addition to searching within your invite list, there’s a new tab just labeled “Search”. This tab allows you to search all WarLight players, not just those on your invite list. This makes it much easier to find players without having to deal with getting their e-mail or adding them to your invite list. There are two restrictions with the global search. First, when searching you must type at least three characters of the other person’s name. This means that players whose names are only one or two characters long won’t be searchable. Second, the search will only return the best 25 matches for your search term. Since WarLight names aren’t unique, if your search target has a very common name (like Mike or John), you may not be able to find them if there are over 25 people with the same name. F: The “Load Template” button only shows up on this screen if you have saved templates. This allows a short-cut to getting to your templates, but it’s really no different than clicking Next -> Change Settings -> My Templates. It’s worth noting that the invite screen allows you to skip it without setting up players. You can always come back to this screen later and set the players by using the Change Players button you’ll see on the next step. The UI (user interface) for creating games has been changed quite a bit. The old process was a linear wizard with steps one through five occurring in a sequence. The new process isn’t as linear, however it’s more powerful and should be much easier to figure out for new players. First off, I want to apologize for changing the UI. I do realize that any time you change UI it causes a great deal of pain. Humans are very habitual creatures, and re-learning how to do something that you used to know how to do is never fun. I didn’t make the decision to change this lightly; I’ve been wanting to improve the game creation UI for a long time. There are lots of improvements I’ve held off of doing over the years in order to roll them all into one big overhaul. It’s like ripping off a band-aid — it’s better to get all the pain at once, not slowly over time. This shows a “Change Settings” button on the right along with a brief summary of the settings and a “Change Players” button on the left with a summary of the players. Below is the “Create Game” button which actually creates the game. After changing either the settings or players, you’ll wind up back here. Several options that used to be dedicated wizard steps have been moved into the configuration screen. For example, the map is now just another tab instead of its own wizard step. The boot times, practice game checkbox, and private messages checkbox are now just additional settings on the “basic” tab. Other than what’s been mentioned so far, everything should be pretty similar to the previous UI. The best way to learn the new UI is to go play with it. If you can’t figure out something, post your question to the forums. I’ll be watching and will be able to help out. Feel free to also chime in if you like or dislike the new UI. Also check out their other WarLight videos. This weekend Lolowut and Mythonian are hosting a LIVE 1v1 tournament. It begins at 6pm GMT on the 15th (11am West Coast US) There will be a live stream shortly after it starts analyzing the games. Seeing your game get analyzed is a great learning experience. Anyone is welcome to join as long as you’re online when it begins. Post a reply in this forum thread if you’re interested in playing. Once it begins, this thread will also have a link to the live stream if you just want to follow along.